Go to Rheumatoid Arthritis for more complete information on this topic. See the images of patellofemoral arthritis below. Patellofemoral arthritis. 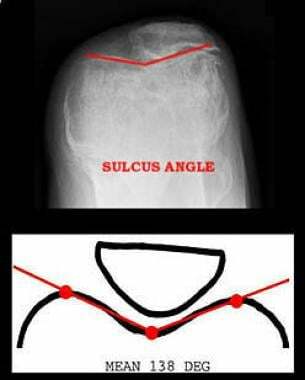 The sulcus angle is the angle formed by the condyles and the sulcus. This is a measurement of trochlear depth. A finding greater than 138° indicates the presence of patellofemoral dysplasia. Patellofemoral arthritis. This patient had severe medial compartment arthritis but a relatively normal patellofemoral joint. Therefore, patellofemoral resurfacing was not performed at the time of surgery. The patella is a sesamoid bone, the largest in the body, embedded in the quadriceps and patella tendons. A subcutaneous bursa separates the patella from the overlying skin. The articular surface of the patella consists of four facets: inferior, middle, superior, and medial vertical. The lateral aspect of the trochlea, the vastus medialis, and the medial patella-femoral ligament prevent excessive lateral translation. The anatomy of the distal femur and the vastus lateralis and lateral patella-femoral ligaments provides restraints against medial subluxation. Articular cartilage in the patella differs from that of other joints in several ways. The patellar cartilage is not necessarily congruent with the contours of the underlying subchondral bone. In 60% of patellae, the thickest area of articular cartilage is located lateral to the thickest area of underlying bone. Some biomechanical studies have also indicated that this cartilage is less stiff and, thus, more compressible than that of other joints. One cadaveric comparison of femoral and patellar articular cartilage showed that patellar cartilage had a 66% higher permeability, a 30% lower compressive aggregate modulus, and was 23% thicker. The proteoglycan content was 19% higher in the femoral cartilage than in the patellar cartilage. Whether these differences help prevent or promote arthritic changes in the patellofemoral joint is not yet clear. Using magnetic resonance imaging, Herberhold and colleagues studied the relationship of static loading to cartilage deformation in fresh-frozen cadaveric knees. [5, 6] After 214 minutes of static loading with 150% body weight, the thickness of the articular cartilage was reduced by 44% in the patella and 30% in the femur. The changes in the thickness of articular cartilage of the patella were greatest at the lateral facet, the area of thickest cartilage. Of note, 7% of the final deformation occurred during the first minute, and 25% occurred in the first 8 minutes. In the initial response to loading, the cartilage appeared to be stiffer than it was in response to prolonged loading. In normal loading, fluid in the cartilage is thought to support the applied load and to prevent cartilage deformation from occurring. The main function of the patella is thought to be improving the mechanical advantage of the quadriceps extensor mechanism by increasing the lever arm of the muscle. The patella also acts to dissipate the forces generated in the patella tendon during knee flexion and extension. Huberti and colleagues concluded that, at normal Q angles, pressure is evenly distributed across the patella. Increases in this angle, however, result either in a shifting of pressure to the lateral facet or a change in the distribution of force. Cadaveric studies demonstrate that with an increasing Q angle, the patella shifts more laterally and rotates medially as the knee is flexed. This change is thought to increase lateral contact at the patellofemoral joint and, possibly, to increase the incidence of patella subluxation and dislocation. In closed-chain exercises with the foot planted on the floor (eg, squatting), contact forces increase with progressive degrees of knee flexion. However, in open-chain exercise in which the foot is off the floor (eg, hamstring curls), no corresponding increase in patella contact force occurs as the knee progresses through a range of motion. The portion of the patella that is in contact with the trochlea also changes during range of motion. With the knee extended, only the distal aspect of the patella contacts the trochlear groove. With progressive flexion, the contact shifts to the proximal aspect of the patella. At greater than 90° of flexion, the contact area is predominantly in the center of the patella, which corresponds to the thickest area of articular cartilage. The medial facet of the patella articulates with the trochlea only during positions of full flexion. The force on the patella increases with knee flexion from 0-60°. However, no consensus exists among researchers regarding the relative amount of force generated with progressive flexion. The contact forces likely are related to the amount of force being generated by the quadriceps muscles during deep flexion exercises. Gait lab analysis has shown that walking with the foot plantar flexed, as occurs when high-heeled shoes are worn, increases the forces in the patellofemoral joint and in the medial compartment of the knee. Patellofemoral arthritis can be a result of inflammatory conditions or mechanical abnormalities. Inflammatory conditions include rheumatoid arthritis; often, the entire knee joint is involved. Mechanical abnormalities can be a result of prior fractures, inherent malalignment, muscle imbalances, or chronic instability. Chronic posterior cruciate ligament injury can lead to instability and pressure on the patellofemoral joint, causing arthritis and pain. Some orthopedists believe that reconstruction of the anterior cruciate ligament (ACL) with a patella tendon graft may lead to subsequent patellofemoral pain, loss of motion, and arthritis. However, whether these late complications are a result of the injury itself, the anatomic alignment that contributed to the injury, or the surgical reconstruction is not clear. In an animal model, ACL transection caused significant changes in joint pressure and the articular cartilage after only 4 months. The thickness of the articular cartilage significantly increased in the patella, the medial and lateral femoral condyles, and in the patellar groove, with total increases in the range of 42-100%. Although the joint contact area was increased, overall peak contact pressures were reduced. The thickening of the cartilage may provide a protective modification of joint pressure, or it may represent early arthritic changes. In a retrospective clinical study, Jarvela et al found an association between prior ACL reconstructions with bone-patella-bone allografts and the subsequent development of patellofemoral arthritis. Although evidence of arthritis along the lateral and medial tibial femoral joints was found in 15% and 18% of these patients, respectively, 47% had radiographic evidence of patellofemoral arthritis. At follow-up at a mean of 7 years, patellofemoral arthritis was mild in 34%, moderate in 12%, and severe in 1%. Shortening of the patella tendon after the index procedure was significantly associated with the development of arthritis. However, the location of the bone tunnel did not correlate with the development of arthritis. Osteoarthritis of the patellofemoral joint should be considered as an entity separate from disease in the medial and lateral tibiofemoral compartments of the knee. Not all patients with patellofemoral arthritis have osteoarthritis in the other compartments; arthritis may develop at different times and with different etiologies in the different compartments of the knee. Some studies have indicated that risk factors for the development of patellofemoral arthritis include increasing body weight, high-intensity running or weight lifting, prior knee injury, and prior patellar dislocation or subluxation. Kujula and colleagues conducted a longitudinal study to address the mechanical factors leading to arthritis of the patellofemoral joint  and found that of those with radiographic evidence of patellofemoral arthritis, 70% had changes to the lateral side of the patella. In this subset of patients, the likelihood of a varus knee alignment was significantly increased compared with those with medial patellofemoral arthritis, who were more likely to have a valgus knee. A total of 292 patients with osteoarthritic knees were evaluated radiographically. In one third of the patients with patellofemoral arthritis, no radiographic evidence of osteoarthritis was present in other compartments of the knee. This isolated patellofemoral arthritis was seen more often in a valgus alignment than was isolated tibiofemoral arthritis. In another study, computed tomography of 40 knees in flexion revealed that in patients with patellofemoral arthritis, the tibial tubercle had a significantly more lateral position than it does in normal knees. However, whether this finding represents a cause or a result of arthritic damage to the joint was not determined. In 1962, Outerbridge observed that half of his patients had evidence of irregularities in the articular cartilage of the patella at the time of meniscectomy. Approximately 5% of patients with osteoarthritis (OA) of the knee have symptomatic patellofemoral arthritis in the absence of tibiofemoral arthritis. 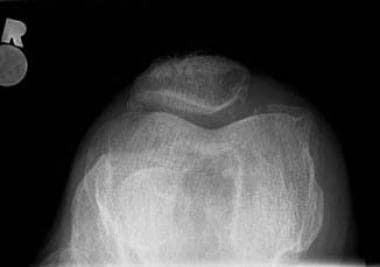 The etiology of the arthritis is divided equally among patellar dislocation, fracture, and primary OA. Kelly MA, Insall JN. Historical perspectives of chondromalacia patellae. Orthop Clin North Am. 1992 Oct. 23(4):517-21. [Medline]. Outerbridge RE. The etiology of chondromalacia patellae. 1961. Clin Orthop Relat Res. 2001 Aug. 5-8. [Medline]. Grelsamer RP, Weinstein CH. Applied biomechanics of the patella. Clin Orthop Relat Res. 2001 Aug. 9-14. [Medline]. Froimson MI, Ratcliffe A, Gardner TR, Mow VC. Differences in patellofemoral joint cartilage material properties and their significance to the etiology of cartilage surface fibrillation. Osteoarthritis Cartilage. 1997 Nov. 5(6):377-86. [Medline]. Herberhold C, Stammberger T, Faber S, Putz R, Englmeier KH, Reiser M, et al. An MR-based technique for quantifying the deformation of articular cartilage during mechanical loading in an intact cadaver joint. Magn Reson Med. 1998 May. 39(5):843-50. [Medline]. Herberhold C, Faber S, Stammberger T, Steinlechner M, Putz R, Englmeier KH, et al. In situ measurement of articular cartilage deformation in intact femoropatellar joints under static loading. J Biomech. 1999 Dec. 32(12):1287-95. [Medline]. Mizuno Y, Kumagai M, Mattessich SM, Elias JJ, Ramrattan N, Cosgarea AJ, et al. Q-angle influences tibiofemoral and patellofemoral kinematics. J Orthop Res. 2001 Sep. 19(5):834-40. [Medline]. Huberti HH, Hayes WC. Patellofemoral contact pressures. The influence of q-angle and tendofemoral contact. J Bone Joint Surg Am. 1984 Jun. 66(5):715-24. [Medline]. Goodfellow J, Hungerford DS, Zindel M. Patello-femoral joint mechanics and pathology. 1. Functional anatomy of the patello-femoral joint. J Bone Joint Surg Br. 1976 Aug. 58(3):287-90. [Medline]. Herzog W, Diet S, Suter E, Mayzus P, Leonard TR, Müller C, et al. Material and functional properties of articular cartilage and patellofemoral contact mechanics in an experimental model of osteoarthritis. J Biomech. 1998 Dec. 31(12):1137-45. [Medline]. Järvelä T, Paakkala T, Kannus P, Järvinen M. The incidence of patellofemoral osteoarthritis and associated findings 7 years after anterior cruciate ligament reconstruction with a bone-patellar tendon-bone autograft. Am J Sports Med. 2001 Jan-Feb. 29(1):18-24. [Medline]. Boyd AD Jr, Ewald FC, Thomas WH, Poss R, Sledge CB. Long-term complications after total knee arthroplasty with or without resurfacing of the patella. J Bone Joint Surg Am. 1993 May. 75(5):674-81. [Medline]. Kujala UM, Kettunen J, Paananen H, Aalto T, Battié MC, Impivaara O, et al. Knee osteoarthritis in former runners, soccer players, weight lifters, and shooters. Arthritis Rheum. 1995 Apr. 38(4):539-46. [Medline]. Nagamine R, Miura H, Inoue Y, Tanaka K, Urabe K, Okamoto Y, et al. Malposition of the tibial tubercle during flexion in knees with patellofemoral arthritis. Skeletal Radiol. 1997 Oct. 26(10):597-601. [Medline]. Johnson LL, van Dyk GE, Green JR 3rd, Pittsley AW, Bays B, Gully SM, et al. Clinical assessment of asymptomatic knees: comparison of men and women. Arthroscopy. 1998 May-Jun. 14(4):347-59. [Medline]. Tanamas SK, Teichtahl AJ, Wluka AE, Wang Y, Davies-Tuck M, Urquhart DM, et al. The associations between indices of patellofemoral geometry and knee pain and patella cartilage volume: a cross-sectional study. BMC Musculoskelet Disord. 2010 May 10. 11:87. [Medline]. [Full Text]. Merchant AC. Patellofemoral imaging. Clin Orthop Relat Res. 2001 Aug. 15-21. [Medline]. von Engelhardt LV, Lahner M, Klussmann A, Bouillon B, Dàvid A, Haage P, et al. Arthroscopy vs. MRI for a detailed assessment of cartilage disease in osteoarthritis: diagnostic value of MRI in clinical practice. BMC Musculoskelet Disord. 2010 Apr 20. 11:75. [Medline]. [Full Text]. Segal NA, Glass NA, Torner J, Yang M, Felson DT, Sharma L, et al. Quadriceps weakness predicts risk for knee joint space narrowing in women in the MOST cohort. Osteoarthritis Cartilage. 2010 Jun. 18(6):769-75. [Medline]. [Full Text]. Crossley KM, Marino GP, Macilquham MD, Schache AG, Hinman RS. Can patellar tape reduce the patellar malalignment and pain associated with patellofemoral osteoarthritis?. Arthritis Rheum. 2009 Dec 15. 61(12):1719-25. [Medline]. Gigante A, Pasquinelli FM, Paladini P, Ulisse S, Greco F. The effects of patellar taping on patellofemoral incongruence. A computed tomography study. Am J Sports Med. 2001 Jan-Feb. 29(1):88-92. [Medline]. Kannus P, Natri A, Paakkala T, Järvinen M. An outcome study of chronic patellofemoral pain syndrome. Seven-year follow-up of patients in a randomized, controlled trial. J Bone Joint Surg Am. 1999 Mar. 81(3):355-63. [Medline]. Brittberg M, Lindahl A, Nilsson A, Ohlsson C, Isaksson O, Peterson L. Treatment of deep cartilage defects in the knee with autologous chondrocyte transplantation. N Engl J Med. 1994 Oct 6. 331(14):889-95. [Medline]. Peterson L, Minas T, Brittberg M, Lindahl A. Treatment of osteochondritis dissecans of the knee with autologous chondrocyte transplantation: results at two to ten years. J Bone Joint Surg Am. 2003. 85-A Suppl 2:17-24. [Medline]. Hangody L, Füles P. Autologous osteochondral mosaicplasty for the treatment of full-thickness defects of weight-bearing joints: ten years of experimental and clinical experience. J Bone Joint Surg Am. 2003. 85-A Suppl 2:25-32. [Medline]. Bentley G, Biant LC, Carrington RW, Akmal M, Goldberg A, Williams AM, et al. A prospective, randomised comparison of autologous chondrocyte implantation versus mosaicplasty for osteochondral defects in the knee. J Bone Joint Surg Br. 2003 Mar. 85(2):223-30. [Medline]. Ghazavi MT, Pritzker KP, Davis AM, Gross AE. Fresh osteochondral allografts for post-traumatic osteochondral defects of the knee. J Bone Joint Surg Br. 1997 Nov. 79(6):1008-13. [Medline]. Fitzpatrick PL, Morgan DA. Fresh osteochondral allografts: a 6-10-year review. Aust N Z J Surg. 1998 Aug. 68(8):573-9. [Medline]. Chu CR, Convery FR, Akeson WH, Meyers M, Amiel D. Articular cartilage transplantation. Clinical results in the knee. Clin Orthop Relat Res. 1999 Mar. 159-68. [Medline]. Shasha N, Krywulak S, Backstein D, Pressman A, Gross AE. Long-term follow-up of fresh tibial osteochondral allografts for failed tibial plateau fractures. J Bone Joint Surg Am. 2003. 85-A Suppl 2:33-9. [Medline]. Gracitelli GC, Meric G, Pulido PA, Görtz S, De Young AJ, Bugbee WD. Fresh Osteochondral Allograft Transplantation for Isolated Patellar Cartilage Injury. Am J Sports Med. 2015 Jan 16. [Medline]. Watkins MP, Harris BA, Wender S, Zarins B, Rowe CR. Effect of patellectomy on the function of the quadriceps and hamstrings. J Bone Joint Surg Am. 1983 Mar. 65(3):390-5. [Medline]. Garr EL, Moskowitz RW, Davis W. Degenerative changes following experimental patellectomy in the rabbit. Clin Orthop Relat Res. 1973 May. 296-304. [Medline]. Ackroyd CE, Polyzoides AJ. Patellectomy for osteoarthritis. A study of eighty-one patients followed from two to twenty-two years. J Bone Joint Surg Br. 1978 Aug. 60-B(3):353-7. [Medline]. Feller JA, Bartlett RJ. Patellectomy and osteoarthritis: arthroscopic findings following previous patellectomy. Knee Surg Sports Traumatol Arthrosc. 1993. 1(3-4):159-61. [Medline]. Joshi AB, Lee CM, Markovic L, Murphy JC, Hardinge K. Total knee arthroplasty after patellectomy. J Bone Joint Surg Br. 1994 Nov. 76(6):926-9. [Medline]. Paletta GA Jr, Laskin RS. Total knee arthroplasty after a previous patellectomy. J Bone Joint Surg Am. 1995 Nov. 77(11):1708-12. [Medline]. Kolettis GT, Stern SH. Patellar resurfacing for patellofemoral arthritis. Orthop Clin North Am. 1992 Oct. 23(4):665-73. [Medline]. van Jonbergen HP, Werkman DM, Barnaart LF, van Kampen A. Long-term outcomes of patellofemoral arthroplasty. J Arthroplasty. 2010 Oct. 25(7):1066-71. [Medline]. Petrie RS, Hanssen AD, Osmon DR, Ilstrup D. Metal-backed patellar component failure in total knee arthroplasty: a possible risk for late infection. Am J Orthop (Belle Mead NJ). 1998 Mar. 27(3):172-6. [Medline]. Krajca-Radcliffe JB, Coker TP. Patellofemoral arthroplasty. A 2- to 18-year followup study. Clin Orthop Relat Res. 1996 Sep. 143-51. [Medline]. Cartier P, Sanouiller JL, Grelsamer R. Patellofemoral arthroplasty. 2-12-year follow-up study. J Arthroplasty. 1990 Mar. 5(1):49-55. [Medline]. Argenson JN, Guillaume JM, Aubaniac JM. Is there a place for patellofemoral arthroplasty?. Clin Orthop Relat Res. 1995 Dec. 162-7. [Medline]. Lonner JH. Patellofemoral arthroplasty: the impact of design on outcomes. Orthop Clin North Am. 2008 Jul. 39(3):347-54, vi. [Medline]. Laskin RS, van Steijn M. Total knee replacement for patients with patellofemoral arthritis. Clin Orthop Relat Res. 1999 Oct. 89-95. [Medline]. Healy WL, Wasilewski SA, Takei R, Oberlander M. Patellofemoral complications following total knee arthroplasty. Correlation with implant design and patient risk factors. J Arthroplasty. 1995 Apr. 10(2):197-201. [Medline]. Ikejiani CE, Leighton R, Petrie DP. Comparison of patellar resurfacing versus nonresurfacing in total knee arthroplasty. Can J Surg. 2000 Feb. 43(1):35-8. [Medline]. Kim BS, Reitman RD, Schai PA, Scott RD. Selective patellar nonresurfacing in total knee arthroplasty. 10 year results. Clin Orthop Relat Res. 1999 Oct. 81-8. [Medline]. Pollo FE, Jackson RW, Koëter S, Ansari S, Motley GS, Rathjen KW. Walking, chair rising, and stair climbing after total knee arthroplasty: patellar resurfacing versus nonresurfacing. Am J Knee Surg. 2000 Spring. 13(2):103-8; discussion 108-9. [Medline]. Smith AJ, Wood DJ, Li MG. Total knee replacement with and without patellar resurfacing: a prospective, randomised trial using the profix total knee system. J Bone Joint Surg Br. 2008 Jan. 90(1):43-9. [Medline]. Tanzer M, McLean CA, Laxer E, Casey J, Ahmed AM. Effect of femoral component designs on the contact and tracking characteristics of the unresurfaced patella in total knee arthroplasty. Can J Surg. 2001 Apr. 44(2):127-33. [Medline]. Schroeder-Boersch H, Scheller G, Fischer J, Jani L. Advantages of patellar resurfacing in total knee arthroplasty. Two-year results of a prospective randomized study. Arch Orthop Trauma Surg. 1998. 117(1-2):73-8. [Medline]. Kawakubo M, Matsumoto H, Otani T, Fujikawa K. Radiographic changes in the patella after total knee arthroplasty without resurfacing the patella. Comparison of osteoarthrosis and rheumatoid arthritis. Bull Hosp Jt Dis. 1997. 56(4):237-44. [Medline]. López-Franco M, Murciano-Antón MA, Fernández-Aceñero MJ, De Lucas-Villarrubia JC, López-Martín N, Gómez-Barrena E. Evaluation of a minimally aggressive method of patellofemoral osteoarthritis treatment at 10 years minimum follow-up. Knee. 2013 Dec. 20(6):476-81. [Medline]. Culvenor AG, Lai CC, Gabbe BJ, Makdissi M, Collins NJ, Vicenzino B, et al. Patellofemoral osteoarthritis is prevalent and associated with worse symptoms and function after hamstring tendon autograft ACL reconstruction. Br J Sports Med. 2014 Mar. 48(6):435-9. [Medline]. Otsuki S, Nakajima M, Okamoto Y, Oda S, Hoshiyama Y, Iida G, et al. Correlation between varus knee malalignment and patellofemoral osteoarthritis. Knee Surg Sports Traumatol Arthrosc. 2016 Jan. 24 (1):176-81. [Medline]. Sanders TL, Pareek A, Johnson NR, Stuart MJ, Dahm DL, Krych AJ. Patellofemoral Arthritis After Lateral Patellar Dislocation: A Matched Population-Based Analysis. Am J Sports Med. 2017 Apr. 45 (5):1012-1017. [Medline]. Hart HF, Stefanik JJ, Wyndow N, Machotka Z, Crossley KM. The prevalence of radiographic and MRI-defined patellofemoral osteoarthritis and structural pathology: a systematic review and meta-analysis. Br J Sports Med. 2017 Aug. 51 (16):1195-1208. [Medline]. Crossley KM, Schache AG, Ozturk H, Lentzos J, Munanto M, Pandy MG. People with patellofemoral OA walk with different pelvic and hip kinematics compared to healthy aged-matched controls. Arthritis Care Res (Hoboken). 2017 Apr 24. [Medline]. Kooner S, Johal H, Clark M. Bicompartmental knee arthroplasty vs total knee arthroplasty for the treatment of medial compartment and patellofemoral osteoarthritis. Arthroplast Today. 2017 Dec. 3 (4):309-314. [Medline]. [Full Text]. Patellofemoral arthritis. The patellofemoral index is the ratio of M, the closest distance between the articular ridge and the medial condyle, and L, the closest distance between the lateral facet and condyle. Patellofemoral arthritis. The lateral patellofemoral angle is the angle between the intercondylar line and the lateral facet. Patellofemoral arthritis. The Insall-Salvati ratio is used to assess the position of the patella and determine if the patella alta or patella baja is present. The ratio of the height of the patella to the length of the patella tendon should be 1:1. Patellofemoral arthritis. Anteroposterior, lateral, and patellar views of an arthritic knee demonstrate severe patellofemoral arthritis. 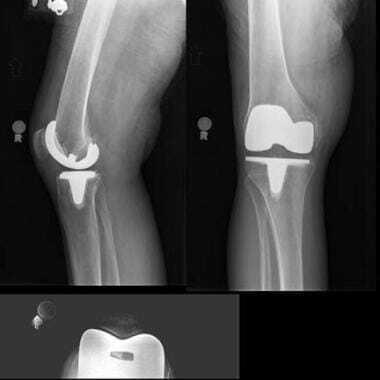 This patient subsequently underwent total knee arthroplasty. Patellofemoral arthritis. Poor bone quality of the patella made a patella resurfacing procedure impossible in this patient who underwent total knee arthroscopy for severe arthritis.